Isagenix 30 Day Performance Pack - Cheapest Prices in Australia! The 30 Day Performance System (which used to be called the Isagenix AMPED Pro Pak) is a complete fitness solution for today’s athletes and active individuals. As the latest Isagenix pack on the market, the Isagenix 30 Day Performance System contains a powerful mix of AMPED products scientifically designed to keep your body performing in peak condition, plus IsaLean Pro shakes, Ionix Supreme, Eshots and more (full product list is below). The products contained in this pack offer a specialised mix of nutrients, protein, amino acids, and natural caffeine to support lean muscle growth and reduce fatigue, allowing you to enjoy optimal performance and a leaner physique. In addition to helping transform your body, the Isagenix 30 Day Performance Pack contains a wide-range of products any athlete or active individual can appreciate. 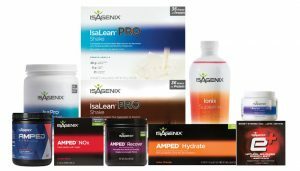 This pack is a popular choice and an excellent introduction to the Isagenix line of products. This system is a comprehensive fitness solution that takes the guesswork out of the confusing world of fitness supplements. Featuring IsaLean Pro Shakes, E-Shots, Replenish, Cleanse for Life, Ionix Supreme, IsaPro and the entire line of AMPED training supplements, the 30 Day Performance Pack is truly one of the most comprehensive collections of fitness products on the market today. Equipped with these products, you’re guaranteed to feel more energetic, reduce fat, build lean muscle, and get the absolute most out of each and every workout. 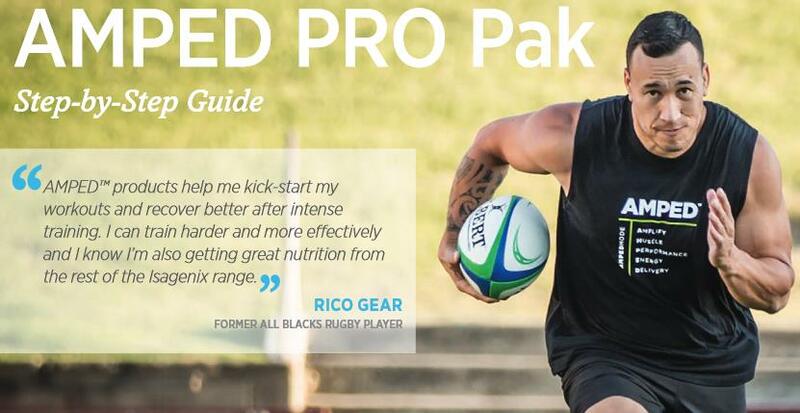 From elite athletes (such as Rico Gear above) who demand the most out of their bodies, to weekend warriors looking to get lean and healthy on their terms, Isagenix is a perfect solution for athletes and active adults of all levels. Time in the gym is critical, but the right nutrition and proper supplement support is vital in getting the best possible results. The Performance System is an ideal nutritional program for anyone looking to complement their training and reach their fitness goals. Containing a perfect mix of Isagenix products offering high-quality protein, natural caffeine, and the essential nutrients your body needs to support muscle growth and recovery, the Pro Pak will allow you to enjoy a lean body and perform at your peak. IsaLean Pro Shakes – Available in chocolate, vanilla and strawberry, Isagenix IsaLean Pro Shakes are nutritious meal replacements that help maintain and support lean muscle. With 36 grams of protein per serving, a shake a day will keep you lean, energised, and satiated. Replenish Post-Workout Drinks – Replenish is a refreshing drink loaded with vitamins and electrolytes to energise and rejuvenate your body mid- and post-workout. AMPED Nitro – This popular Isagenix product is a pre-workout supplement that prepares the body and allows it to stay strong all workout long. AMPED NOx – Similar to AMPED Nitro, AMPED NOx is a pre-workout supplement that prepares the muscles to perform at their best during the toughest of exercises. AMPED NOx is available in single shot servings, providing you with a quick and easy way to prime your muscles for optimum performance. Ionix Supreme – Ionix Supreme is an all-natural drink rich in minerals and specialised adaptogens that allow your body to adapt better to stressful situations. E-Shots – These nutrient-rich liquid energy shots contain caffeine from yerba mate and green tea for added energy, improved focus, and better physical performance. Cleanse for Life – Cleanse for Life is a proprietary blend of Aloe, antioxidants, minerals, and cleansing herbs designed to support the immune system and nourish the body. With all of these products on your side, a leaner, healthier, and possibly richer self is right around the corner. Download the following PDFs or contact Nicole. How Can You Buy the 30 Day Isagenix Performance System?